Bearings are important structural components used in many industries like construction. Just like any other mechanical elements, Bearings also make use of other mechanical element parts to maximise their effectiveness. 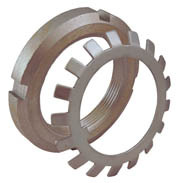 Lock Nuts, sometimes referred to as "Shaft Nuts", are used to secure bearings in place together with Tab Washers. Tab Washers, also known as "Lock Washers", are reliable fastening elements that accompany Lock Nuts to fasten them securely to the Bearing. These washers have an internal tab that’s folded into the slot so they can be fitted into a shaft keyway. After the lock nut is fully tightened around the Bearings, one of the tabs can be folded into the slot to firmly secure the Lock Nut. For various sizes of Lock Nuts and Tab Washers to secure your Bearings, view our extensive range of products. With our Power Transmission products, including V Belts and V Pulleys, we have all your mechanical needs covered. Can't find what you're looking for? – Contact us.